Just a few days before the end of the year, we went to Madrid to get our U.S. visas sorted since we found out that we won’t be able to change our current passports to biometric ones. We took the AVE late on Monday for our early morning appointment the following morning at the U.S. embassy. That evening, we were debating where to go for dinner and decided to try a restaurant that my brother in-law, J, had recommended. We booked their earliest table -9:00 p.m., as this is Spain, and hung around at the hotel lobby until we had to leave for dinner. 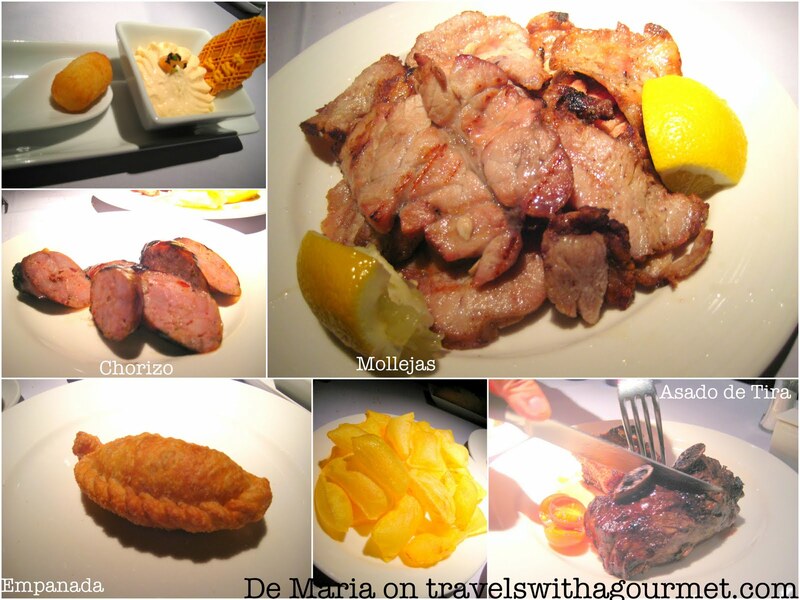 De Maria is a grill restaurant which opened in 1994 with both Argentine and Spanish specialties which is obvious from their menu. There are the classic Argentine starters like empanada (meat pastry) , Provoleta (cheese, grilled with oregano) and chorizo (pork sausage) as well as Spanish starters like huevos rotos (scrambled eggs on fried potatoes) and jamon Iberico (ham from acorn-fed Iberian black pigs). Argentine parilla (grill) classic cuts such as Asado de Tira (beef short ribs) and Bife de Chorizo (rib-eye) are listed alongside Spanish grill classics like Chuleton de Buey (T-bone steak). The interiors are cozy with an exposed brick wall on one side and mirrors on another. White linen-covered tables line the room and the glass-enclosed grill is at one end for all the diners to see. There is also a wall of framed photos of De Maria’s more prominent guests from the drummer of QUEEN to the Spanish former prime minister Felipe Gonzalez and Spanish tennis player Rafa Nadal. There were also several footballers on their photo wall who are rumored (at least according to J) to frequent the restaurant and take advantage of it’s proximity to the Santaigo Bernabeu stadium. We didn’t take too much time looking at the menu and stuck to the Argentine-side and ordered accordingly – empanadas to start, followed by a some mollejas (sweetbreads) and finally a chorizo and asado de tira for our main course. Surprisingly, there were only pommes souffles ( a typical Spanish side dish) or roasted potatoes for sides dishes and no fries on the menu at all. We settled for the pommes souffles and a half bottle of Protos crianza (so in fact, we did order something Spanish). We were given some olives followed by an amuse bouche of a tiny ham croquette and some salmon mousse which were both delicious. Next up were our empanadas which were fried (a good sign) and filled with the requisite mixture of oregano and pepper-flavored ground meat. The empanadas were very good although they should have been served piping hot rather than warm. Good thing they were were served with chimichurri. Our plate of mollejas (sweetbreads) arrived next. Sweetbreads are our personal litmus test for Argentine parillas who know what they are doing and De Maria passed with flying colors. The sweetbreads were thinly-sliced and grilled until the edges started to get crispy – a perfect mouthful of hot, crisp and soft all at the same time. And they were served with lemon which is all it needed – just a squirt of acidity to make each mouthful perfect. The chorizo and short ribs came last accompanied by the souffle potatoes – the chorizo was sliced (not typically done) and tasted good enough although the ground sausage meat was too fine and not chunky enough so it didn’t quite taste like the real thing. The short ribs though were excellent – meat and fat marbled together on the bone and jugoso (juicy, the word Argentines use, although the Spanish prefer “poco hecho” or not that cooked). The potatoes were a bit of a letdown – too fiddly to eat as they can’t be forked and too oily to pick up with ones fingers. The portions were fine except for the sweetbreads which were so much that we couldn’t finish them (better for our cholesterol). After our meat feast, we had no space left for dessert and just asked for the bill. They brought the check with two small mini-desserts: yoghurt mousse and a shot of pineapple sorbet. The pineapple sorbet was just right – a little shot tart frozen pineapple slush that helped clear the palate after our heavy meal. 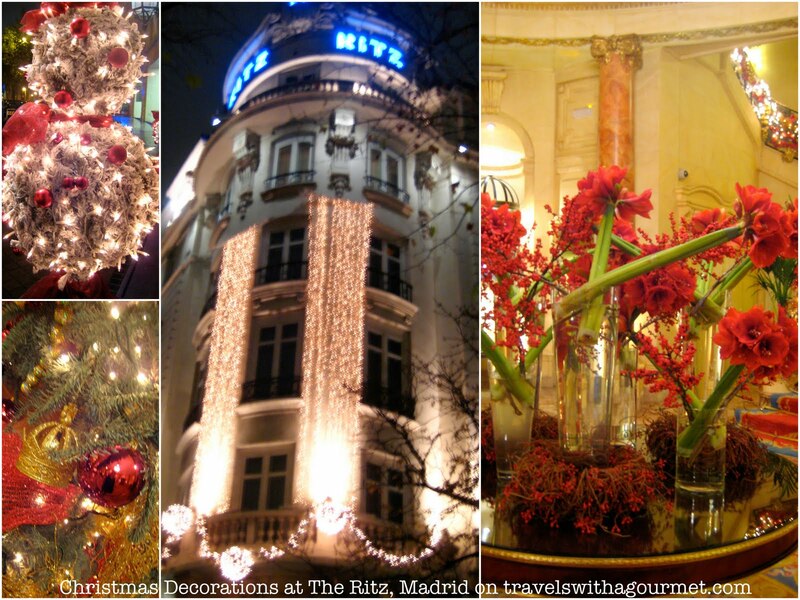 We decided to walk off our dinner by heading back down the Castellana until we got tired and flagged a cab to the hotel where we had a coffee at the lobby bar and enjoyed the lovely Christmas decorations of the Ritz.